At company board meeting on 22 April 1952 that meeting voted to go ahead and use company money ($20,000,000) — more than the company had - to fly a prototype jet transport. Actually called the 367-80, this aircraft was rolled out on 15 May 1954 and first flew on 15 July 1954. Despite its size and speed it had manual flight controls, in all respects the 367-80 proved to be excellent. The Boeing 367-80, the first American turbojet airliner, was unique in having a wing sweep-back of 35 degrees, and four engines suspended in pods below the wings. 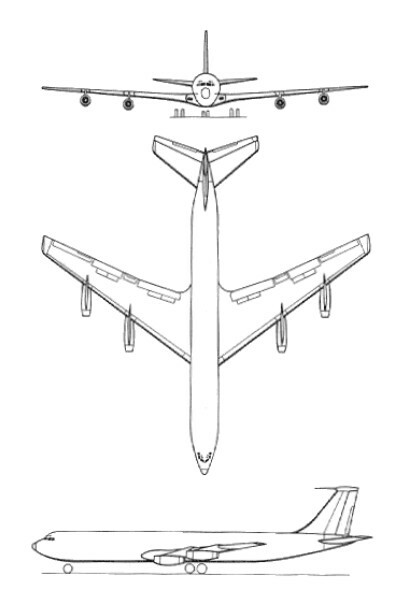 In October 1954 an order came through for 29 KC-135 Stratotankers, based on the 367-80. These were allocated the designation KC-135A, and the first of them made its initial flight on 31 August 1956; 10 months later, on 28 June 1957, the first was delivered to Castle AFB, California. This military version of the Model 367-80 is identified as the Boeing Model 717: it differs primarily from the later Model 707 by having a smaller-diameter fuselage, deletion of cabin windows, reduced size and weight, and accommodation for 80 passengers or an equivalent weight of cargo on the main deck. All equipment for the tanker role is carried on the lower deck, or normal cargo area, and includes the pivoted 'Flying Boom' refuelling gear. This was modified subsequently by the provision of an adaptor to allow for probe-and-drogue refuelling of Tactical Air Command and US Navy/Marine Corps aircraft. Power is provided by four 6123kg thrust Pratt & Whitney J57-P-59W turbojets. The Model 717 Stratolifter family differs from the foregoing by being equipped specifically to serve as long-range transports. These have the refuelling boom deleted, but there is a structural similarity between these two basic tanker/lifter types, with interior changes in the latter providing accommodation for up to 126 troops, or 44 stretchers plus 54 sitting casualties. Galley and toilet facilities are provided at the rear of the cabin, and provision is made for an alternative all-freight role. The initial version was the C-135A with turbojet engines, first flown on 19 May 1961, and delivered to MATS on 8 June 1961 to become the USAF's first strategic jet transport. KC 135A 58-0091; courtesy Ron Bennett, Crew Chief, 1982-84, Minot AFB. Some three dozen KC-135 Stratotankers (first flown on 31 August 1956) or C-135B transports have been modified to serve the USAF and other government agencies in specialised reconnaissance roles. The USAF plans to re-engine some 630 KC-135A tankers with fuel-efficient CFM-56 turbofans, under the designation KC-135R. The programme began in 1983, and is due to run until 1995. The prototype conversion flew on August 4, 1982, and prod-uction deliveries started in 1984. KC-135Rs are expected to remain in service until 2020 at least, probably with further avionics updates later. Eleven French Air Force KC-135Fs are also being retrofitted with CFM-56s as KC-135FRs. The first was delivered in August 1985. Ten KC-135As were modified to EC-135K standard as airborne relay aircraft. Under a separate programme, 104 Air National Guard KC-135s, together with 24 Air Force Reserve and 23 special-mission aircraft, are being re-engined with JT-3D turbofans acquired from retired airline Boeing 707s, and are known as KC-135Es (in tanker configuration). The first was completed in July 1982. Four RC-135As were camera-equipped for photo-mapping, but most of the RC variants, including RC-135C, RC-135D, RC-l35E, RC-135M, RC-135S, RC-135T, RC-135U, RC-135V, RC-135W and RC-135X, carry nose-mounted and side-looking radars and other sensors. Some RC variants have the original 13,750 lb st (6 237 kgp) Pratt & Whitney J57-P-59W turbojets; others have been converted to have 18,000 lb st (8 165 kgp) TF33-P-9 turbofans. The KC-135 featured tanking equipment and an all-Boeing powered boom. Fuel was carried in the belly and wings and power was generated by use of four J57 powerplants. The system was generally crewed by three personnel though additions could be made when mission-specific (5 are utilized in the MEDEVAC role for instance). In 1967 eight standard Boeing C-135s were converted by Douglas Aircraft Company to ARIA (Apollo Range Instrumented Aircraft) EC-135Ns. Each aircraft carries inside its bulbous nose a dish-shaped radar antenna to track spacecraft and lock on to them for the transmission and reception of radio messages and data telemetry between the NASA Manned Space Flight Centre at Houston, Texas, and the Apollo programme. The 707 has also been operated by the US military as the VC-135. The Navy received congressional approval to modify two Boeing NKC-135s into electronic warfare aircraft to be used for electronic warfare training of the fleet. The RC-135W is derived from the RC-135M, and differs from the RC-135V in having turbofan engines. Equipment-wise it is similar to the "V", but it has a longer SLAR cheek, which cuts into the crew door area rather than stopping short of it. Also, a pair of viewing ports have been added to the overwing hatch on the RC--135W. The "V" features additional airconditioning intakes on the engine pylons. The Republic of Singapore Air Force took delivery of the first of four KC-135R Stratotankers on 10 September 1999. The former USAF KC-135A was withdrawn from ARMARC and updated with CFM56 engines and a Boeing developed multi-point refuelling system. It has bith the normal KC-135 refuelling boom and hose together with hose and drogue units under each wing. ERV-94 of the French Air Force at Istres received the last of 11 C-135FRs on 13 April 1988, serial CI (12737). Boeing converted these and equipped them with new CFM turbofans. Two modified KC-135As are used by the US Federal Aviation Administration (FAA) to check navigation aids throughout the United States. Engines: 4 x Pratt & Whitney J57-P-59W turbojet, 13,750 lb. Wing span: 130 ft 10 in (39.88m). Length: 136 ft 3 in (41.53m). Wing area: 2433 sq.ft (226.06sq.m). Max wt: 297,000 lb (134,715 kg). Typical cruise: 532 mph @ 45,000 ft.